Your complete one-volume guide to the year 2018. This fantastic and in-depth book includes month-by-month forecasts for every sign and all you need to know to find out what is in store for you in the year ahead. The only one-volume horoscope you’ll ever need. Your essential guide to love, life and career success in 2018. 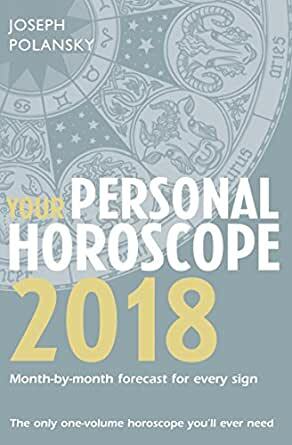 This popular, complete one-volume guide contains all you need to know about your personal horoscope for the year 2018. Be prepared for the forthcoming year with monthly predictions for your own sign and discover how to maximise your opportunities and potential to make the most of 2018. • A month-by-month forecast of your best days and worst days – the ideal days to attract love, money or success, and when it’s better to just stay in bed! 4.0 out of 5 starsAccurate or Not? I just got with Joseph a year ago and I've been hooked because he gives such a great detailed description of the month-to-month forecast. Whether you believe it or not is up to you, but it's great to have a little guide. I have bought this horoscope book every year since 2010, and I will never buy any other. It has features that I have not seen in any other horoscope book, for example, month by month forcasts for each sign, focused on work, love, health, etc. If you know your ascendant, it will be even more helpful. I love everything about this book. I have been reading Polansky's Personal Horoscope for over 6 years. Predictions according to planetry influence have been amazing. I am very impressed with this author. I always start my year of with my copy of this book.My family and friends are addicted to this book as well.I wish I could learn more about the author. Love this, so helpful, get it every year. If you know your rising sign, also read the predictions for that sign, more accurate than your sun sign.